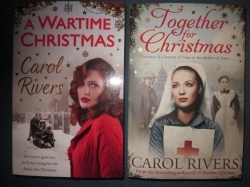 I read some wonderful books last year, but the one I looked forward to the most was The Fight For Lizzie Flowers by the bestselling saga writer Carol Rivers. I always look forward to Carol's books, but this one was extra special because it continues the story of Lizzie and the other characters from Lizzie of Langley Street. This week I am thrilled to welcome Carol to my blog to talk about what it was like to write a sequel. Carol, welcome! Your books have given me so much pleasure, not to mention the sleepless nights when I just had to find out what happened next. I'm delighted to have this opportunity to ask you some questions about what it was like to write The Fight For Lizzie Flowers. Thank you for the warm welcome, Susanna. Apologies for the sleepless nights - I hope I can provide you with many more of them. I love checking in with your blog and am grateful for this opportunity to join your many noteworthy guests. First of all, whose idea was it to write a sequel to Lizzie's story? Yours or your agent's/publisher's? And, out of all your heroines, why Lizzie in particular? LIZZIE OF LANGLEY STREET was my first novel for Simon & Schuster and Lizzie has always been 'waiting in the wings.' When my editor asked me how I felt about developing her story, I knew at once this was the time for her to step back on stage. How long have you known what happened next to Lizzie? Was the plot of the sequel bubbling away for a few years? A writer, I believe, has a kind of silver cord to their characters. Perhaps we are just the cast's 'agent,' as in theatre life? I often role play aloud, then meditate quietly on my breathing and almost at once, my mental theatre begins, as if opening my agency doors. Could you talk a little about the logistics of writing a sequel, especially such a long time after the first book. Did you feel it was a different process to writing a stand-alone novel? A sequel requires information from previous books. I enjoy dialogue, because it's natural and you can't fall into the trap of long paragraphs of description which might bore or confuse the reader. Back to agenting again! Keep to the 'show don't tell' rules - and you won't stop your cast from vocalising. Is there an extra responsibility when writing a sequel? Not just to your readers, but also to your characters? Writing is entertainment. If the juggler juggles well, you watch mesmerised. If not, you turn away. If the car salesman gives you a rough demo ride - he doesn't sell his car. If the actors on stage capture your attention, you'll continue to sit in your seat. It's a writer's one responsibility to cause the reader to turn the pages until the satisfactory last. I have to ask you about that wedding scene. Talk about a dramatic beginning! Did you agonise over how to start the book or was that scene in your head already? Lizzie and Danny's romance was fraught with problems. In THE FIGHT FOR LIZZIE FLOWERS, what could be more problematic than - - won't say, as it might spoil the surprise. If what happened to Lizzie had happened to me... well - perhaps it almost did! Were there tough decisions to make about who and what to include or leave out of the sequel? And how do you tackle a story from the outset? I would say, for the most part, planned decisions. I need an outline. Some writers don't. They write by the seat of their pants, now known as 'pantsters.' But working with a traditional publisher has trained me to plan - and plan for many reasons. Publishers need some kind of upfront information. From this, they can market your book early enought to create a demand on the electronic shelves. As for keeping to the outline, detours are inevitable. Nelson didn't duck quickly enough, Churchill's Dardenelles campaign was fatally flawed. Both detours took the war in different directions. The writer, however, is the creator of the work and must know the way. If you have to provide plot information in advance to Simon & Schuster, does this mean you wouldn't be able to change your plot if a wonderful new development occurred to you that your characters were dying to get involved in? Your outline is just your road map and there are always detours - roads up, wrong turns, floods! But you have your road map to guage your overall direction. Just make certain your new development results in a satisfying ending for your readers. What is it about Lizzie that readers love and identify with? Readers tell me they identify with Lizzie's independence, loyalty and family spirit. My test of character? I like to think I would live next door to Lizzie and I would never need to go to the movies for entertainment! For me, one of the most intriguing aspects of the book was the way you developed the Flowers brothers, Danny and Frank. How important is character in driving the plot? I absolutely adore them. When the brothers step on stage, one with bravery, one with cowardice, I shiver. They are two sides of the one coin. Danny falls short, Frank steps in. Frank voices his fears, Danny hides them. I could write about this deceptive duo forever! To finish, I have to ask you this, as a number of people have asked me to put the question - might Lizzie's story become a trilogy? Without a doubt. I'm bringing back the whole cast. Lizzie's story isn't told by half. Like us all in the modern world, Lizzie is fighting to achieve her dreams. She sits in my temporal lobe whispering tantalising secrets. Once again, I can't wait to write them! Thank you for joining me today, Carol, to share your thoughts and provide some insight into your work. I hope I can tempt you to return, as long as you don't mind being bombarded with more questions! I've really enjoyed being your guest, Susanna. Once again, thank you for giving me the chance to answer your insightful questions. I'd love to come back, perhaps next time with news of this year's book, a 1950s novel set in the East End and Soho, with a very ambitious 19-year-old heroine, Ruby Payne, an incorrigible shopaholic and fashion addict. Carol's family comes from the Isle of Dogs, East London; she now lives in Dorset. 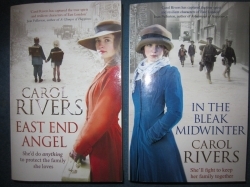 The East End is Carol's backdrop to her historical family sagas, whch are published by Simon & Schuster. Her stories spring from the warm-hearted and resourceful neighbourhoods of the East End - the heart of London's docklands. Her rough-tough Cockney characters tell it like it is, giving a punch to the stomach and leaving the reader in no doubt that her feisty heroines are a force to be reckoned with. Carol's website, where you can find out more about her books and subscribe to her quarterly Newsletter keeping you up to date with her news, Blitz recipes, quizzes, freebies and photos. Thanks for your thoughts, Jen. I'm glad you found the interview relevant and useful. I know you are working hard at your writing at the moment - I hope it is going well. Lovely to hear from you, as always. Thanks to both of you for a very interesting interview which is a treat for both readers and writers. As I'm currently revising the second book in a contracted series, the thoughts about writing a sequel are especially helpful to me. Nicola, thank you for your comments. I agree - it must be a rich experience for an author to revisit a cast of characters and give them the chance to have more experiences and face further challenges, which in turn will make them develop as people. I think that is one of the strengths of The Battle For Lizzie Flowers - the characters grow and deepen. I have read other sequels where the author simply left the characters as they were and found those to be disappointing books. Jan, lovely to hear from you. I'm delighted you enjoyed the interview and I'm glad you found something to inspire you as you complete your dual narrative book. Thank you for such an interesting interview. As a writer, it is so rewarding to revisit a successful cast. Wishing Carol lots of continued success. What an interesting interview, both! Thank you, Carol and Susanna. I love the sound Lizzie's story and I enjoy sequels. Your comments about having an outline in answer to the question about how much to include and how much to leave out in your new sequel rang home with me. I feel it's the same for dual-narrative novels. I love the image of the silver cord! The idea of being likened to a theatrical agent appealed to me too, Wendy. Like an agent in the acting world, a writer has to ensure that the part each character plays in the story is true to themselves. Any writer will immediately identify with Carol's ideas. She has summed up the relationship between writer and characters beautifully. Thank you for your comment. I love the idea of us being like our characters' agents - attached by a silver chord. It is so true. Thank you for a lovely interview, Susanna and Carol. Compelling is the word, Susanna. And yes, sequels really do need to be! What a wonderful way to describe a sequel, Julia - catching up with old friends. Every book that an author writes has to be write to the best of her/his ability, of course; but I do think that writing a sequel of a much-loved novel carries a special responsibility, because the readers need a story that is every bit as compelling as the original. There's something special about sequels - almost like catching up with old friends. I hope Carol never stops writing, every book by her is guaranteed to be a breath of fresh air to the imagination. Thanks for your comment, Jackie. I was hoping you would read Carol's interview, as I know you are currently finishing writing a trilogy. I agree with you that the idea of revisiting a character after a number of years is intriguing - but it all relies upon having a strong story and character to start with. Wendy - lovely to hear from you. I'm looking forward to meeting Ruby as well! Great interview - interesting idea to bring back a character after so much time has elapsed. A lovely insight to Carol Rivers and her creation of the silver cord. I'd like to ask Carol when she reflects back to writing her first novel is there anything she would change? What have you learnt from your writing journey? Many thanks and I can't wait to meet Ruby Payne! Good question, Chris! I'm sure that after the success of the Lizzie sequel, Carol's readers will be hoping for sequels to their own favourites. Thanks for dropping by. I would like to ask Carol if any of her books could have a sequel. I like Bella of Bow Street and the characters who seem to have a continuing story. Good to hear from you again, Louise. I've been thinking about your comment and can see why reading the books the 'wrong' way round wouldn't matter. As you say, they are strong stories and that means each can stand on its own. Also, after reading book 2, it must have been a treat to delve into the Babs plot in depth in book 1. 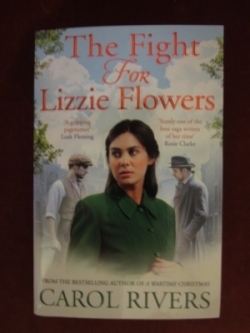 "The Fight for Lizzie Flowers" was the first book I read by Carol Rivers and I loved it. That scene in the registry office had me hooked from the start. After that I read "Lizzie of Langley Street" and reading the books that way round didn't spoil "Langley Street" at all. They are both such strong stories. I think Lizzie is a wonderful character and I hope there will be a third book about her. It's a great pleasure to welcome you onto my blog, Carol. I have been looking forward to this for ages. I hope everyone will enjoy reading the interview and that the writers out there will pick up some tips. Good morning Susanna and everyone who calls by! Thank you for having me on your guest blog today. I always love to check in with Susanna's posts as I pause mid-morning with a cuppa and nibbles. So many diverse authors to read and enjoy their tips and comments. Well done Susanna for all your help and inspiration; and of course your stunning roses!